What displays can you recommend for my exhibit? We will recommend specific displays for your exhibits that will really sell your product. For example: If your literature is 1 1/2" or less, you would be interested in our counter displays C793. If your material is 2 1/2" or less, you would consider using table top displays M60 which is the imported version of Mr. Popularity model C794. We can also ship directly to your event so you won't have to worry about shipping the displays twice. Please feel free to call us to speak with one of our knowledgeable representatives at 609-396-1117. We also offer 3rd Party shipping via FedEx and UPS using your account at checkout. Are the racks easily transported? Our displays fold flat and are packaged in a sturdy carton with an EZ-Carry hand hole making it convenient to carry in and out of your event. Greeting card and some other similar models do not have the EZ-Carry handle cartons. We do offer quantity discounts. Please call us with your requirements and we will be happy to give you a price. 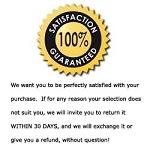 We will exchange or refund your purchase without question if returned within 30 days of purchase. Please call us for return authorization number. Do you use lead free paint to coat your racks?